Sulphur is a city in and county seat of Murray County, Oklahoma, United States. Start off your visit on the 11th (Mon): contemplate the long history of Chickasaw Cultural Center and then admire the majestic nature at Chickasaw National Recreation Area. To see where to stay, ratings, traveler tips, and more tourist information, you can read our Sulphur online attractions planner . Dallas to Sulphur is an approximately 2.5-hour car ride. Traveling from Dallas in March, Sulphur is little chillier at night with lows of 42°F. Finish your sightseeing early on the 11th (Mon) to allow enough time to travel to Oklahoma City. 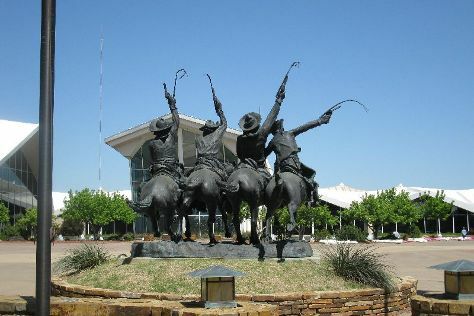 Do some cultural sightseeing at National Cowboy & Western Heritage Museum and Bricktown. There's still lots to do: appreciate the history behind Oklahoma City National Memorial & Museum, indulge your thirst for a good beer at Bricktown Brewery, examine the collection at Oklahoma Sports Hall of Fame, and get curious at Science Museum Oklahoma. To find photos, reviews, ratings, and tourist information, you can read our Oklahoma City trip maker tool . You can drive from Sulphur to Oklahoma City in 1.5 hours. In March, daily temperatures in Oklahoma City can reach 65°F, while at night they dip to 40°F. Finish up your sightseeing early on the 14th (Thu) so you can go by car to Tulsa. Sometimes known as the "Buckle of the Bible Belt," Tulsa is the second largest city in Oklahoma. Kick off your visit on the 15th (Fri): admire the masterpieces at Woolaroc Museum & Wildlife Preserve, then admire the masterpieces at Gilcrease Museum, and then stroll through Owen Park. Keep things going the next day: stroll through Tulsa Zoo, then explore the world behind art at Philbrook Museum of Art, and then take in the architecture and atmosphere at Holy Family Cathedral. For photos, other places to visit, where to stay, and more tourist information, go to the Tulsa trip builder site . Drive from Oklahoma City to Tulsa in 2 hours. Alternatively, you can take a bus. In March, daytime highs in Tulsa are 64°F, while nighttime lows are 40°F. Cap off your sightseeing on the 16th (Sat) early enough to travel to Hugo. Hugo is a city and county seat of Choctaw County, Oklahoma, United States. Start off your visit on the 17th (Sun): stroll the grounds of Showman's Rest and Bull Rider's Reprieve, then identify plant and animal life at The Endangered Ark Foundation, and then immerse yourself in nature at Raymond Gary State Park. To see ratings, reviews, traveler tips, and more tourist information, go to the Hugo tour itinerary site . Traveling by car from Tulsa to Hugo takes 3 hours. In March in Hugo, expect temperatures between 67°F during the day and 45°F at night. Cap off your sightseeing on the 17th (Sun) early enough to travel back home.